Conceived and collaboratively written by Therapeutic Program participants in honor of their amazing family members and caregivers. 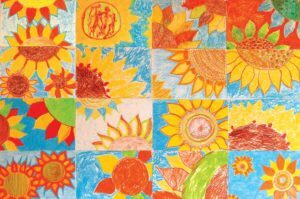 To download and print a copy of the poem with original sunflower artwork created by Schurig Center artists, click here. I was me and you were you. Thank you dearly for all you do. Because of you my isolation has uncurled. my horizons, petal by petal, moment by small moment. Your allowing me to be steeped in this world is everything. I pet an animal, give it food. I feel the sandy beach improve my mood. you are biggest when you are slow with me. Matching me there you show your grace. yet overall your care for me remains unmarred. even when it’s hard to love myself and not get testy. Your patience and belief in me are enduring gifts. Your encouragement fills me even when your presence drifts. At life’s darkest you wove my past into hopeful future possibility. >Even in the hospital you made the case. You said I’m brave, smart, athletic, powerful. You tell me, told me. You are a fighter, a competitor! You are darn funny, too. she said, not knowing she spoke of your luminosity. Trying to capture them with my art. humbly honoring the Sunflower you are. 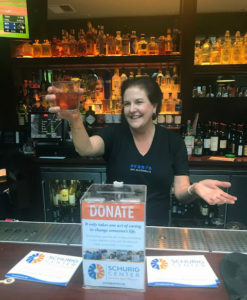 Schurig Center would like to extend a very warm thank you to everyone who joined us on July 12 for cocktails at Perry’s on Magnolia as our guest bartender Schurig Center Board member Catherine Way tried her hand at ‘mixology’ behind the bar. 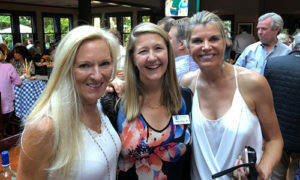 It was a wonderful night of community connection! 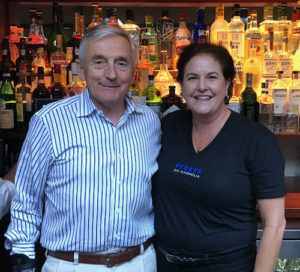 Special thanks to Catherine for donating her tips from the evening to benefit hope and healing at Schurig Center and…very, very special thanks to Perry Butler and the awesome staff at Perry’s on Magnolia for welcoming our community of friends for the evening. 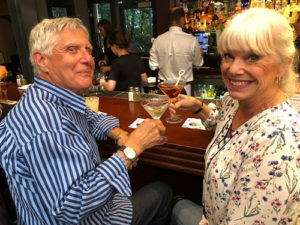 Please join us in thanking Perry’s by stopping in at the restaurant for drinks and dinner sometime soon. Cheers! What a treat to sit and talk with Bruce Bochy in the Giants dugout! Besides baseball, we talked player injuries, meditation and wine. 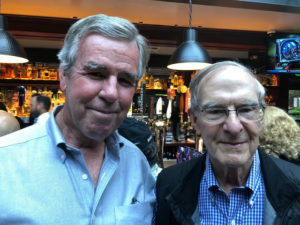 Celebrating my birthday with a true bucket list event was a treat. 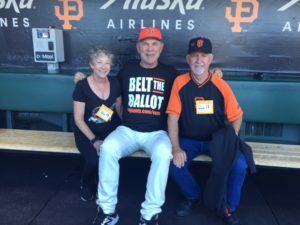 We joined sports writer, Joan Ryan on the field to meet Bruce Bochy, Brandon Crawford and Hunter Pence before the game, and then visited the broadcast booths during the game. 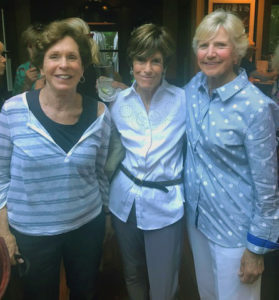 We had field level tickets with Joan and passes to the Gotham Club. Thank you Joan for donating this amazing event to the Schurig gala and then making it all happen! 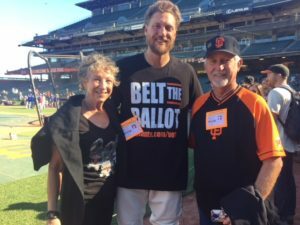 Schurig Center would like to thank both Joan Ryan and the San Francisco Giants for offering this experience in support of Schurig Center’s annual BAM Gala and also to Kati and Mike for bidding so generously on this item at the gala. Even though the Giants lost, hope and healing were the big winners! 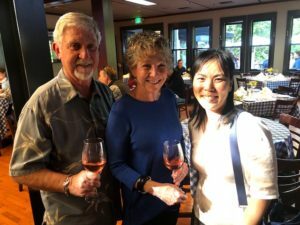 All proceeds from this experience benefitted the Karen Schurig Scholarship Fund – providing access to rehabilitative and support services for 70% of Schurig Center’s clients who live on a low income. This day at the ballpark truly changed lives. Thank you! Sometimes we all need a little help from our team. 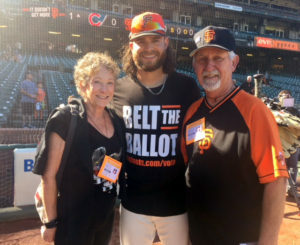 Check out Brandon Crawford’s personal message!